here's another 'Fast, Cheap & Easy' TM project that does exactly that! my mom had this fall wreath stored in the garage. she's used it for years, and it's okay. but i knew i could make it better, and look exactly like the ones we saw over at a swanky store. so i simply MADE one for her instead, by making over the wreath she already had. 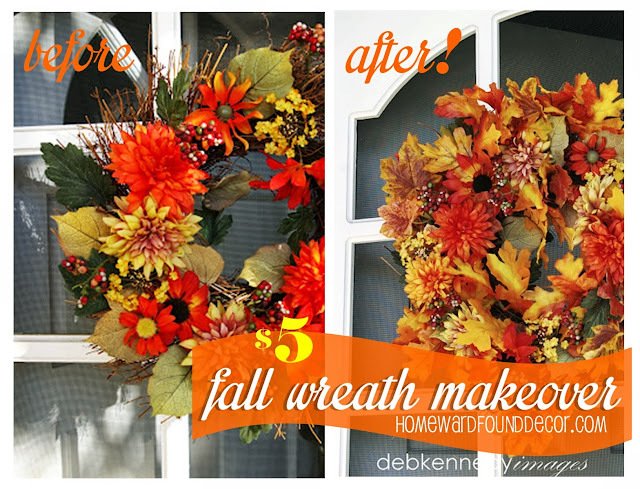 continue reading to see how EASY it is to freshen up an old wreath! i enlisted one of my TOP TIPS as a stylist: cheap fake foliage. yep. i went to the Dollar Tree and bought some stems of colorful fall fabric leaves for a buck each. mom had a few larger branches of dull-colored leaves that i mixed in, too. but i'm just showing you how to 'pump up the volume' of something you already have on hand. and slide the leaves up toward the ends of each branch. cut all of the small branches of leaves off of the larger branches, as shown here. leave @5 to 6 inch stems on them. you'll end up with a large supply of short-stemmed leaf bunches. because i wanted them to be in the 'background' of the arrangement. by pushing the stems into the wreath structure, they should stay in place with no problem. when you tuck them in, nestle them behind the existing foliage as shown here. continue around the wreath until you have used all of that type of leaf. you'll have a balanced arrangement working with one type at a time. place them closer to the front of the arrangement, right next to the existing flowers, etc. this helps to keep the wreath's rounded shape intact as you work. after adding the additional leaves, the wreath looks three times its original size! that's a pretty big improvement over the sparse twiggy 'before' shot, don't you think? with a candle, cloche, bowl, or pedestal in the center. * sit them on top of an urn or planter, then nestle a flowering plant in the center. * use them as a 'tree skirt' for a small holiday tree. Thank you so much, Diana - it's really EASY, I promise!